It being Valentine’s weekend, I had planned on going to the most miserable venue imaginable. But as happened last week, my original plan was subverted and I had a romantic offer that I could not refuse for five guys. 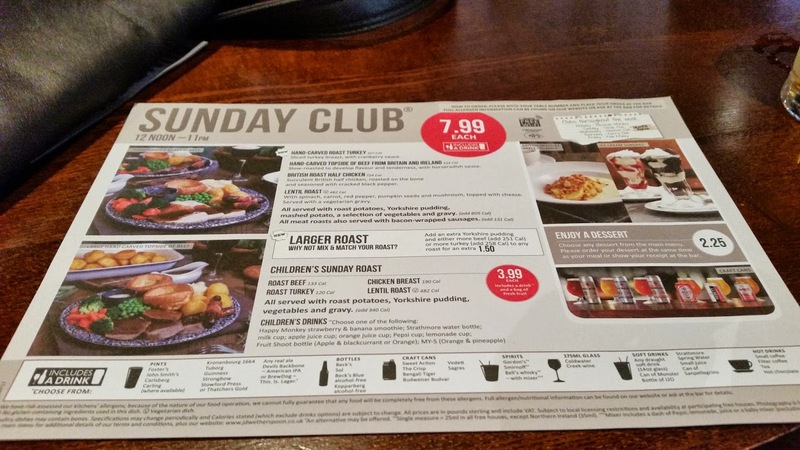 No, not the burger chain in the Oracle, but five of us guys decided upon a romantic Sunday roast in the Malmaison. Upon initial inspection, it isn’t the cheapest at £19.95. However this includes unlimited starter, the roast itself and dessert. 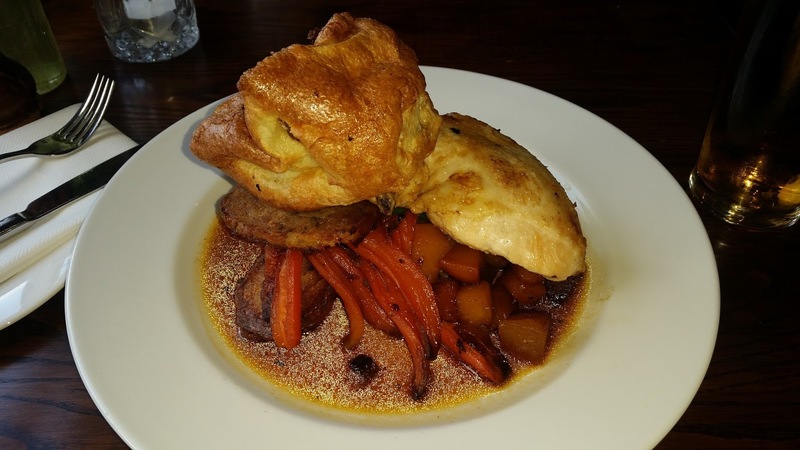 This is a roast dinners review page so I will not go into detail on the starter and the dessert, however they have to be taken into consideration as it is a full 3-course meal on offer – there was no option to pay less and just have the roast dinner. The starter was a buffet spread, with bread, olives, cured meats, posh sausage rolls, smoked salmon – even a whole blimmin’ salmon. The chef was also on hand to prepare a salad, if one so desired. Unlimited starter is dangerous. I wouldn’t say it was especially special. It wasn’t anything I couldn’t have prepared myself by opening a packet of sliced cured meats from Sainsburys. What was special was the dessert. There were several options, none of which massively appealed until I heard about the dessert de jour – until then I was about to select the cheese and biscuits as default, which did include a gravestone biscuit. The dessert de jour was…drum roll…chocolate cheesecake. Did I build up the suspense enough? It was pretty immense in taste, with 3 distinct sections, though a rather tough biscuit to cut with a spoon. It was the icing on the…cake. It was also an impressively generous-sized slice too. What wasn’t so impressive in size was the roast dinner. I had the choice of beef with Yorkshire pudding or corn-fed chicken with stuffing and a sausage wrapped in bacon, but no Yorkshire pudding. WTF? I requested the chicken dish but with a Yorkshire pudding to be included as my Valentine’s gift. She was clearly charmed by my beauty as I was successful in my request. When the main course arrived (we waited a reasonable length of time between courses if you are reading dear Edible – at least 15 minutes between taking away our starter plates and bringing the main course), the main plate consisted of a piece of chicken, one smallish Yorkshire pudding, two small round slices of stuffing and one small chipolata wrapped in bacon. With just two vegetable medleys between five guys. And just the tiniest drizzle of gravy. Can you see it? My granddad taught me to save the best until last, so let’s start with the mixed medley of vegetables, as is traditional, which really were a mixed bunch. The carrots were sensational. The tastiest ordinary carrots I have reviewed so far. The green beans were good too – slightly flexible but still crunchy, and tasted superb with the gravy. I never get mine that good. The parsnips were not so impressive – parsnips really should be roasted. And speaking of what should be roasted – potatoes. Why can nowhere do decent roast potatoes? They were average, at best. The kind of deep-fried efforts that fall apart – with a solid outside as opposed to roasty-crispy goodness. Thankfull you cannot really go wrong with pigs in blankets, and this was a high-grade chipolata wrapped properly in some tasty bacon. The stuffing wasn’t so high-grade – it was how I would imagine a £5 coin to be, in terms of thickness and a consistent circumference. 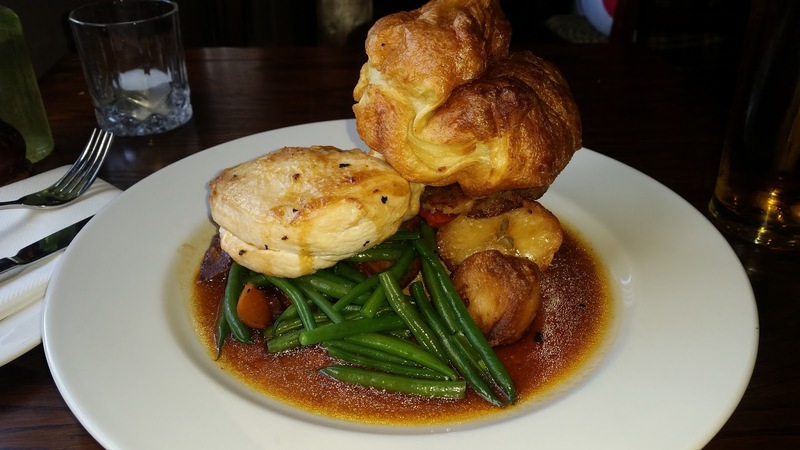 It seemed factory-made and a little out of place – though it worked well when mixed with the Yorkshire pudding and chicken. The Yorkshire pudding was a little anaemic, and a little little too. Too strong a taste of vegetable oil and really not one of the best offerings I have had. I had always kind of assumed in an I’m from up north what’s wrong with burning coal to heat your house kind of way that corn-fed chicken was something that only rich yummy-mummy vegetarian lesbians had. Why feed corn to a chicken? Well it turns out that average-income childless carnivorous non-lesbian blokes really appreciate corn-fed chicken too. 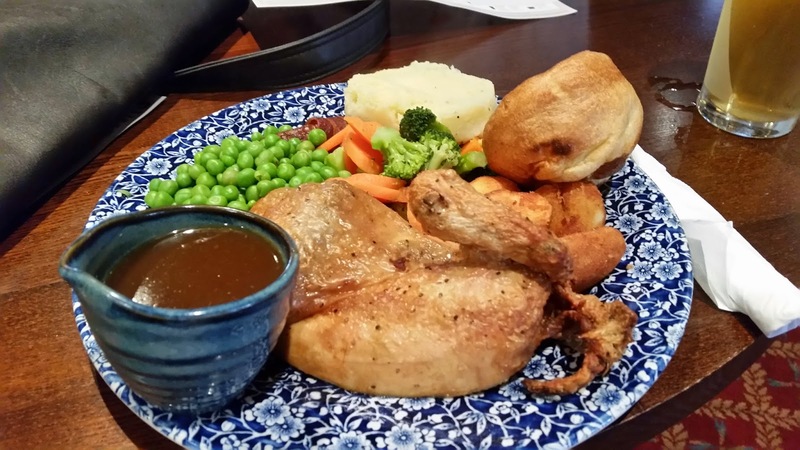 It was so plump and succulent – it tasted like chicken is actually supposed to taste like. There was ‘only’ a chicken breast but aforementioned plumpness usurped any desire for more. An excellent piece of chicken. I did have a bite of the beef too – it looked amazing, though it only tasted very good. And finally, the dribble of gravy. All five of us requested extra gravy. We received one miniature gravy boat’s worth. So we requested extra gravy again. And received one miniature gravy boat’s worth. Either they weren’t getting us, or we weren’t getting it. It was however a really good gravy, chicken-stock based with a reasonably thick consistency. Good work. Overall it was a good roast but it is a difficult one to rate. Do I take into unlimited starter and the dessert? Due to them being included in the price, I feel that I have to, to some extent as £19.95 for just that roast dinner would have been extortionate. Plus service charge. Which four of us thought was reasonable though far from spectacular service, however the Canadian amongst us was unimpressed. Apparently you get far better service over the pond. But do you get good gravy? 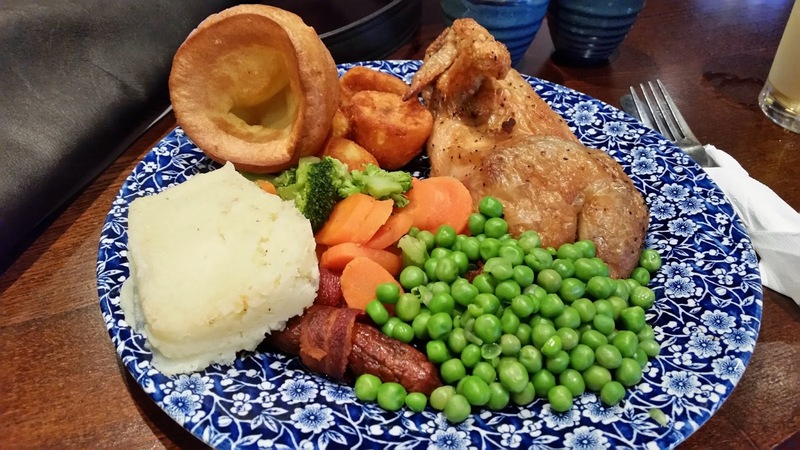 This is a roast dinners in Reading blog and therefore the rating is focused on the roast dinner part. Had I been reviewing the whole 3 courses in that context, it would receive a slightly higher rating. As it was, I feel that a 7.4 out of 10 is appropriate. Full marks for meat and carrots, low marks for ‘roast’ potatoes and yorkies. Next Sunday I am heading east.